The Mighty Muzzle is a tough, durable and comfortable basket muzzle that provides maximum safety. It will allow your dog to pant, drink and treat train with the uniquely designed bar spacing which forms the muzzle. This easily adjustable product comes with a webbed adjustable strap with high quality buckle, as well as a over-the-head chrome plated spring hook, to allow this muzzle to fit any sized neck. The neck strap is made from neoprene material to provide additional comfort for your dog. 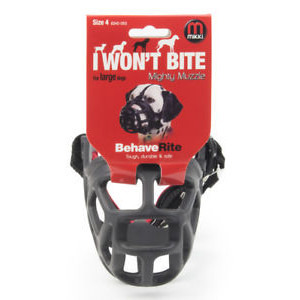 The muzzle also has a collar attachment to prevent your dog from pulling it off. If your pet is keen on chasing other animals or shows predatory signs, then a muzzle can prevent injury or death. Legally, if the dog bites he MUST be on lead for everyone's safety. A Mikki Multi Lead can be used as a double ended lead, so you can attach to a collar, headcollar or harness and prevent lunging. Alternatively, you can also use a Mikki Recall Training Lead, which allows your dog to exercise without the risk he will rush up to a person or dog and attack. Allow enough space for you to slide one finger inside the muzzle, round the side of your dog’s nose. This will enable them to pant, drink and for you to give titbits during training sessions. Practise putting the muzzle on, then reward and praise your dog to encourage it to relax. Secure the overhead strap to the collar or neck strap. When first introducing the muzzle to your dog, only put it on for short periods of time, building up until it is used to it and comfortable with how they feel. NOTE: muzzles should not be worn whilst your dog is unattended. Mikki's grooming products are made by groomers, for groomers. Mikki has led the way in developing quality products that really work. From the very beginning, Mikki has been a firm favourite among professionals and they strive to make professional quality available for everyone. If you’ve got a pet, Mikki have got a grooming tool for you! Where possible shipping costs will be quoted online, as shipping rates can fluctuate we may on occasion contact you to amend shipping charges before dispatch. We are happy to accept orders for collection by your own courier service. We aim to dispatch your order the same or following working day. The delivery method will be dependent on order size/weight and will be by Royal Mail, or Courier. Note: Orders sent Recorded Delivery or via courier will require a signature on delivery. All goods must be inspected on delivery. Occasionally goods may be lost/damaged in transit and we will send a replacement order if this occurs. In all cases we must be informed of loss/damage within 48 hours of receipt or order date, otherwise no claim can be made or replacement sent. In the unlikely event that there is a shortfall or error with your order, please call us as soon as possible and within 48 hours of receiving the goods. You have the right to cancel within your order within seven days of of ordering, or seven days of receipt of the goods (whichever is the longer). If you do decide to cancel you order, we will refund the full purchase price including postage providing the goods are returned unopened/unused within 14 days of receipt. Return postage/shipping for cancelled orders will be at your expense. If you have ordered the incorrect goods in error, we will replace them providing they are returned unopened/unused to us within 14 days of receipt. Please note that this will incur a return delivery charge. This does not affect your statutory rights as a consumer. Please ensure that all returns provide your contact details and a short note explaining the reason. Please ensure that a reason is given even if you have discussed this with us by phone. If you have used this product please write a review to let us know what you thought of it.